Spacejunk is similar to a classic vertical shump, except the player is our beloved planet Earth! The goal of the game is to survive randomly generated waves for as long as you can. 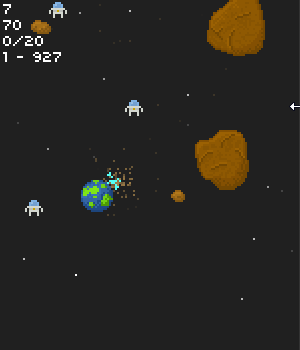 There will be spacemines to avoid, asteroids to blow up, astronauts to save, and other planets to defeat. After each wave, you can upgrade the Earth by spending spacedust you have accumulated. I was originally planning to be done by sometime this week and have it up at FGL, but the project has evolved a bit. Once I got to the original ‘complete’ point, I realized there wasn’t enough content. So I’ve been adding ideas that I think of through the day and also from my friends who have been kindly testing the game for the past few weeks. Anyway, just wanted to have more of an explanation of my current project. I will post some screenshots and maybe even a game play video when time draws nearer to release date! So I went through several projects before I settled on the one above. The first thing you may notice is the Earth…yes I reused assets. The goal of the game is to maneuver the Earth around and survive the increasingly difficult waves of space junk, which mainly consists of asteroids. It’s sort of like Asteroids and a vertical shump combined into one. It WILL contain upgrades and a high score table as I will be attempting to get this game sponsored this time around. More to come in a few days! I had to configure the default settings before I was able to play because it was set to the awkward controls mouse for movement and WASD for firing. After reversing the controls, I found my self in a pretty easy asteroids-like game. But it got hectic once there were 20+ asteroids bouncing off the sides of the screen instead of warping to the other side like the original Asteroids. 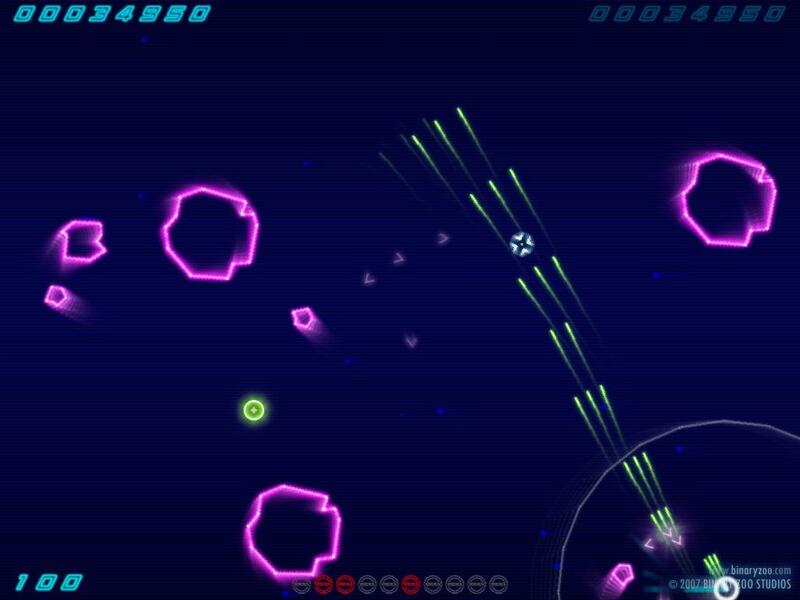 The asteroids even eventually take on some AI and start following you around. The purple ones are your basic free flying rocks, but other colors charge after you or chase you down. I’d definitely pick this one up if your looking for a fresh remake of Asteroids. Or can’t afford a copy of Geometry Wars.